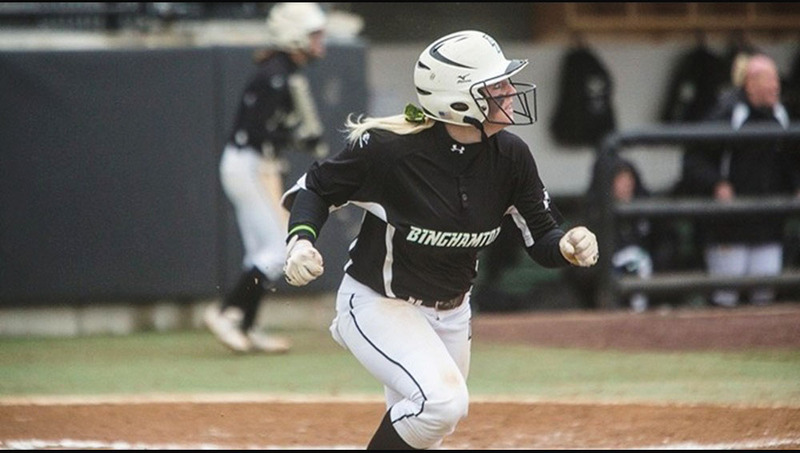 Provided by Binghamton University Senior outfielder Bridget Hunt hit 1-for-3, drawing a walk and getting hit by a pitch in a doubleheader against Hofstra on Tuesday. Despite going into the seventh inning of game one up 4-1, the Binghamton softball team failed to hold on to its lead Tuesday afternoon, dropping the opener of its doubleheader against Hofstra, 7-6. The Bearcats (18-21, 8-2 America East) continued to struggle in the nightcap, as they were shut out, 9-0. Despite strong pitching and sound defense for a majority of the first game, it was the Bearcats’ pitching and defense that ultimately cost them both games. Binghamton used all five of its pitchers, but freshman Rayn Gibson was the only one who didn’t face difficulties against the powerful Hofstra lineup. Gibson went four innings with no earned runs, a walk and four strikeouts. BU’s bats got hot early in game one; the Bearcats jumped out to a 3-0 lead off a home run from junior center fielder Jessica Rutherford in the bottom of the third. The dinger was Rutherford’s team-best fifth of the season; she also leads BU in batting average (.395). In the top of the seventh, Binghamton quickly gave up its three-run advantage as Hofstra (23-17, 9-4 Colonial Athletic Association) tallied six runs in the final frame. The Bearcats answered right away with Rutherford hitting a single, which was misplayed by Hofstra and rolled to the wall. Rutherford attempted to score on the play, but was called out at home plate. Two runs were scored on the play, cutting the Binghamton deficit to one, but the decision to send Rutherford proved to be costly. BU failed to pick up any more momentum, losing the first game, 7-6. Hofstra freshman pitcher Alyssa Irons held the Bearcats in check in the second game, striking out four and giving up only three hits in a complete-game shutout. BU trailed 4-0 heading into the top of the seventh inning, but sophomore pitchers Makenzie Goluba and Allison Pritchard had trouble finding the strike zone in relief of freshman pitcher Rozlyn Price. The three pitchers combined for 10 walks and gave up nine runs in the lopsided defeat. Irons came away with two wins on the day, improving her record to 5-7. Rutherford and senior outfielder Bridget Hunt were the main sources of the Bearcats’ offense Tuesday. Hunt batted .333 on the day and consistently posed a threat on the base paths for BU. Binghamton’s game against Albany on Wednesday was postponed, but the Bearcats are set to resume conference play this weekend when they face Maine in a three-game series. First pitch is set for Saturday at 1 p.m. at the Bearcats Sports Complex in Vestal, New York.